This calming pose will cool an overheated mind anytime, summer or winter. A few weeks ago I promised to fill in the blanks of the cooling yoga sequence I’d suggested – the poses that hadn’t already made it onto this blog in the form of a Five-Minute Yoga Challenge. I meant to do it, really I did. Then we lost our summer, temporarily. At about the same time, I misplaced my brain. One day it was there; the next day I opened the door to my writing mind and a moth flew out. My best guess is that it went on vacation without me. Now the summer is back, at least for this week, and so am I. 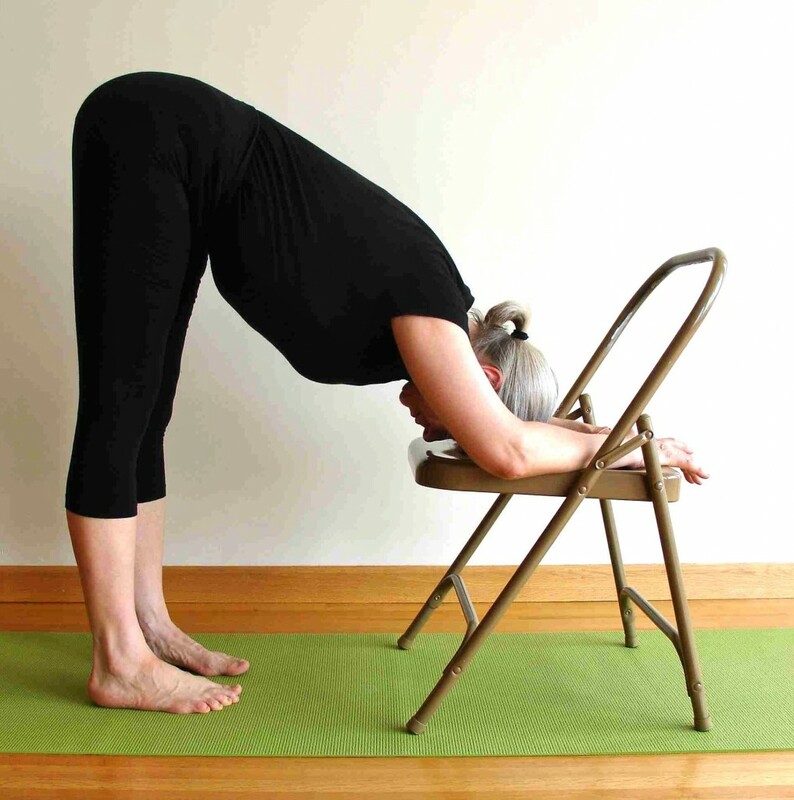 While I have the chance, here are more detailed instructions for cooling off by resting your head on a chair seat in Uttanasana (standing forward bend), and then making your way into chair Savasana (relaxation pose, literally corpse pose). You don’t have to be feeling hot and bothered to benefit from this set of poses. Overly busy in your mind? Feeling a familiar soreness in your lower back? This restorative yoga session is a great way to settle both of them down in five to 15 minutes. Stand facing a chair with your feet hip distance apart and parallel. Press your feet into the floor, firm your front thighs and, hinging from your hips, come into Uttanasana, standing forward bend. Bring your head to rest on the seat of the chair, as in the photo above. The most satisfying pose comes from finding the right height to put under your head. If your head doesn’t easily reach the chair, then place yoga bricks (or thick books) on the chair seat until you find the right height. That’s where you’ll feel an intense and yet pleasant hamstring stretch, while allowing complete relaxation through your upper body. If your back feels strained, if your leg muscles quiver and your hamstrings cry out in pain, you need more height under your head. Remember that the prop comes to you – you don’t reach to bring yourself in contact with the prop. Once you have the right height in place, notice how your forehead connects with the chair or the bricks. Make sure the skin of your forehead moves toward your eyebrows. If it moves toward your hairline, you’ll feel stimulated, not relaxed. Rest your hands on the seat of the chair. Now take your mind back to your feet. Press down into your big and little toe mounds and the centres of your heels. Lift your inner ankles, inner knees and inner thighs. Roll your front upper inner thighs towards each other. Lift the top three inches of your front thighs and press them back toward your thighbones. Keep your legs firm and relax your upper body. Let your arms rest on the chair. Relax your belly. Watch the ebb and flow of your breath. You may notice your belly rising softly and without effort towards your spine. Stay in the pose for at least one minute, or for as long as you’re comfortable. Then take your hands to your thighs, press in, and stand up slowly. One blanket on the chair, one under your head, and a strap: the Cadillac ride. Sit down in front of your chair. If you’d like the full props version – the Cadillac ride – take one blanket for the seat of the chair and one for behind your head, and tie a strap around your thighs, a few inches from your knees. Have the strap wide enough that you can keep your thighs parallel, and tight enough that when you relax your legs, they stay parallel. Swing your calves up onto the chair seat. Lie back on the floor and support your neck with the blanket. Take your hands to the back of your head and gently lengthen your neck. Release your arms and turn your palms to face the ceiling. Soften your face and eyes. With your lips together, and your teeth slightly parted, exhale and completely let go your jaw. Let go of the root of your tongue and the base of your throat. Imagine your breath as a guest in your body, and watch it come and go: soft, natural inhalation, soft, natural exhalation. With each exhalation, release the weight of your body toward the floor. Now take your awareness into your lower back. As you exhale, watch your breath leave your body through your lower back. Notice a pleasant warmth in your lower back, as it spreads both longer and wider with each exhalation. When you’re ready to come out, draw your knees towards your chest and roll to the right-hand side. Stay on your side for a moment. Look down at the floor as you slowly sit up. Take a quiet breath or two, and notice how you feel. You may, as I do, find yourself filled with gratitude for the extraordinary technology of yoga, and especially Iyengar yoga, so powerful, and so readily available once we slow ourselves down enough to use it. Next post: Are you ready to commit to a daily practice?